In bathinda , Usha Mission Multispecialty Hospital is a recongnized name in patient care. 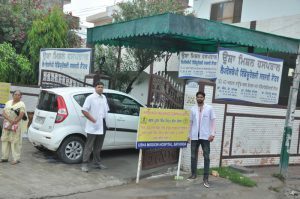 They are one of the well-known Hospitals in Bhatinda City. Backed with a vision to offer the best in patient care and equipped with technologically advanced healthcare facilities, they are one of the upcoming names in the healthcare industry. Located in , this hospital is easily accessible by various means of transport. A team of well-trained medical staff, non-medical staff and experienced clinical technicians work round-the-clock to offer various services . Their professional services make them a sought after Hospitals in Bhatinda. A team of doctors on board, including specialists are equipped with the knowledge and expertise for handling various types of medical cases. The hospital offers a spacious lobby set in an aesthetic ambience. We offer a number of super deluxe rooms with all modern facilities at their best. It is manned by highly qualified doctors and paramedical and nursing staff. State of the art intensive care ambulance, equipped to reach you in the hour of need. Free pickup within a range of 10 kilometers.